Bonus : $1,000 STARTUP Bonus Start trading without any investments and risks right now! 2. Registration without verification . 3. No deposit needed . 4. Automatically credited to your account . Withdraw : No, only profits can be withdrawn after trading 3 lots for each $1 USD profit. Fixed bonus profits can be withdrawn after a certain amount of BUY or SELL trades are completed. The total volume of the trades should equal to X*3 InstaForex lots, where X is the total volume of fixed bonus profits. Only the total and full amount of bonuses can be withdrawn, partial withdrawals are impossible. In order to withdraw bonus funds from a trading account, a trader should send a request to bonuses@instaforex.com. The bonus funds are not available for withdrawal; however, profits gained from trading the bonus funds can be withdrawn if all requirements stated in this Agreement are met. After any withdrawal from the account, profits gained with the InstaForex StartUp Bonus are canceled in the amount equal to the withdrawal amount. 1. 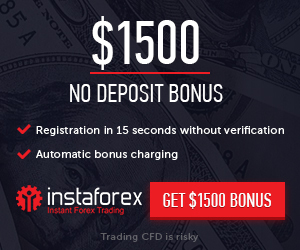 The InstaForex StartUp Bonus is a no deposit bonus. Every new Client of the Company has the right to get this bonus. 2. When opening an account, to which the InstaForex StartUp Bonus will be credited, the Client is required to specify the data that matches the one in his/her ID. It is prohibited to change personal data such as the full name once the Bonus is credited. 3. The InstaForex StartUp Bonus is not available for cent accounts. 4. The InstaForex StartUp Bonus and fixed bonus profits cannot be invested in PAMM accounts, but can be used to copy trades in the ForexCopy system. 5. The Client agrees to receive information about the company services on the contacts specified when registering the bonus account.